Highly strung individuals in the rat race consider deep slumber an ill afford luxury. But sleep deprivation can lead to lethargy, inattention, tiredness, and even hypertension in severe cases. The mind and body cannot operate in optimal conditions, and the quality of life or work is seriously compromised. While we can get help with diet or weight control, exercise, and medical treatment for better health, there are hardly any useful devices to help one measure and monitor quality sleep at night. The Zeo Personal Sleep Coach is set to change all that. Zeo is a tiny sleep fitness device which will measure and record personal sleep information and indicate to users the quality of their sleep. 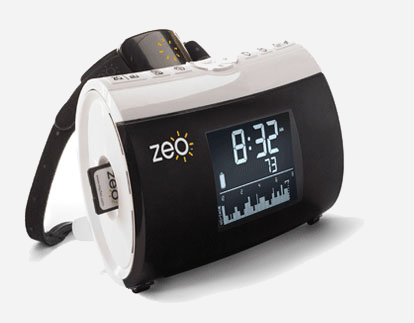 The Zeo personal sleep coach package comes with a Zeo Headband, a Zeo Bedside Display and an SD Memory card. Users need to wear the Zeo Headband when they go to bed. The headband will track and measure users’ sleep patterns via a sensor which monitors electrical signals from the brain. The sleep data will thence be transmitted wirelessly to the Zoe Bedside display. The data will be recorded in the memory card. Users can thence upload their sleep data via internet to the “myZeo Personal Coaching” Web site. Users can do further analysis and spot the trends in their sleep based on the daily sleep journal created. Sleeping disorder can cause chaos in one’s life; the ability to monitor sleep much like one monitor heartbeat or blood pressure may do wonders to enable one to tackle the problem more systematically. While money cannot buy quality sleep, it can certainly help us to monitor sleep to achieve better quality and results.